Galway-Mayo Institute of Technology (GMIT) is set to double the size of its Innovation Hub (iHub) building at the Galway campus following €5 million funding approval from Enterprise Ireland. Minister for Jobs, Enterprise & Innovation Mary Mitchell O’ Connor announced the funding details during a visit to GMIT today (Thursday 18 May), welcomed by GMIT President, Dr Fergal Barry, Enterprise Ireland Director – West Region Barry Egan, and Dr Rick Officer, VP for Research & Innovation, GMIT. Enterprise Ireland will contribute €3 million towards the cost of the building extension while GMIT will provide €500,000; Enterprise Ireland also approved funding of €1.8 million for the New Frontiers Programme 2016 – 2020 which is delivered in GMIT’s two Innovation Hubs by New Frontiers Manager Tony O’Kelly. New Frontiers is Enterprise Ireland’s national entrepreneur development programme for innovative, early stage start-ups. 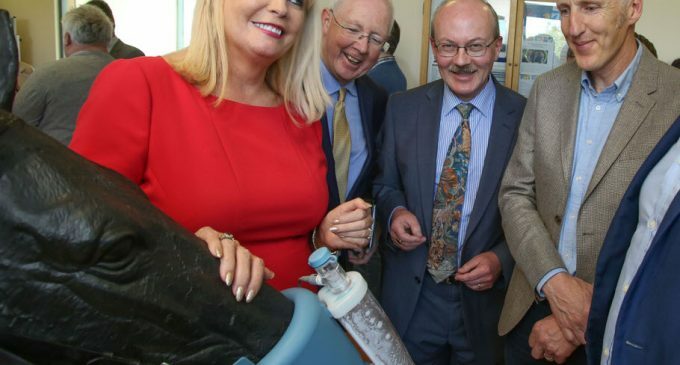 Previous participants on the GMIT New Frontiers programme include DiaNia Technologies, Contego Sports, TaxHug, Allergy Lifestyle, Wildwood Vinegars, Rockfield Medical, BriteBiz and VT Networks. GMIT’s Building & Estates Office are in the process of appointing a design team for the extension works. It’s hoped that construction work will commence in 2018. The proposed extension aims to increase the floor space of the iHub to 2,400 square metres from its current 1,150 sq m.
GMIT’s Innovation Hubs have contributed significantly to the economic and social development of the region since their establishment in Galway and Mayo 10 years ago. The iHubs are currently fully occupied, accommodating some 46 enterprises. Client companies currently occupying the iHubs include Marvao Medical, OneTouch Telecare, Capsos Medical, Rockfield Medical, BlueDrop Medical, Kite Medical, GIRT, CALP, Cloud Strong, Siscin, Traffic Attic, Tr3Dent and Happy Media to name a few.